Monopoint (Round/UFO) High Bays or Linear High Bays: When to Use What? “Should I use UFO High Bays or Linear High Bays on this project? In many cases, the existing fixture configuration of the space determines which High Bay to choose. This is even more so if your project is a retrofit that demands a one-to-one replacement. 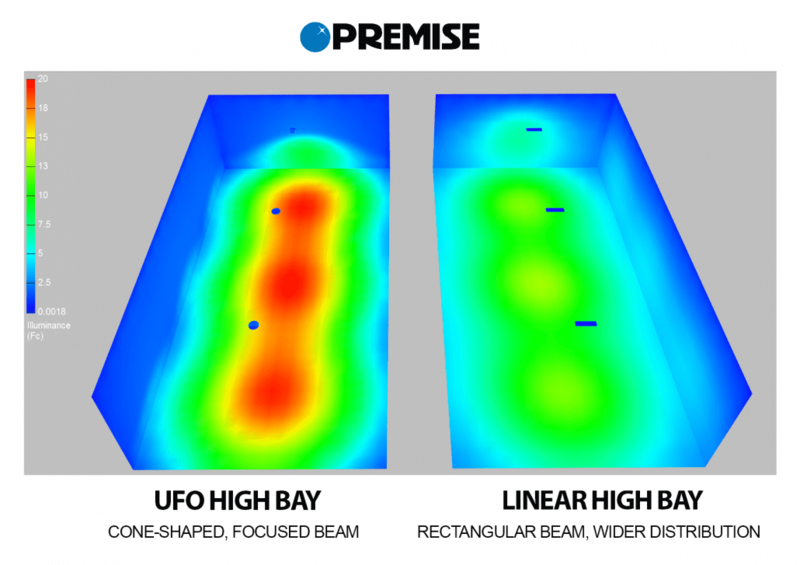 Since many high ceiling spaces have traditionally been illuminated by Metal Halide lamps that are constructed in a round shape (because the bulbs were round), the first LED High Bays were modeled after them and resulted in the introduction of UFO High Bays. For this same reason, if you are working on a one-to-one replacement for metal halides, then UFO High Bays would be the ones to choose. However, there are also existing spaces that use traditional fluorescent T5HO and T8 High Bays. In this situation, Linear High Bays would be the ideal replacement. What is the height of the ceiling? Anything higher than 35 feet would be better served with UFO High Bays. Linear High Bays just don’t have the output or beam spread to be effective above 35 feet. What is the spacing? If the fixtures will be far apart from each other, then Linear High Bays might be the better way to go as they typically have wider beam angles. Is the footprint of the space an open area or does it have passageways or aisles? UFO High Bays are great for open areas such as airports and factory floors, while Linear High Bays are the effective choice for maintenance bays or cold storage areas with high shelves. Will the environment be prone to harsh conditions such as dust, moisture or water? The majority of UFO High Bays in the market are IP65 rated, providing the fixture with protection from such harsh conditions. There is less selection of Linear High Bays that are designed in this way. The shape of a fixture is not only for aesthetics. Different fixture form factors cast different beam sizes and shapes. Round-shaped High Bays like the UFO will cast cone-shaped beams (usually 120 or 90 degrees), making them suitable for light distribution in a more focused and controlled way. But this also means that if they are spaced too far apart from each other, you may experience undesirable “white spots” in between where the cone-shaped beams can’t reach. On the other hand, Linear High Bays will cast rectangular beams, so they will efficiently distribute light over areas such as aisles and long workbenches. Keeping shape and beam size in mind will help you when you are creating your lighting design. One thing that is often overlooked but can typically make or break the budget is the cost of installation. It’s something we always ask our customers to consider. For High Bays, the UFO style has a clear advantage: it only requires one point drop to wire and install. Linear High Bays, on the other hand, require two-point drops to install. It is also harder to level and straighten a square fixture versus a round fixture. All of this potentially doubles the time required for electricians to complete the install. Still confused about choosing between using our UFO High Bays and Linear High Bays? Don’t worry! While our recommended considerations should help you narrow down a choice, there isn’t a definitive answer as every project has its unique requirements. 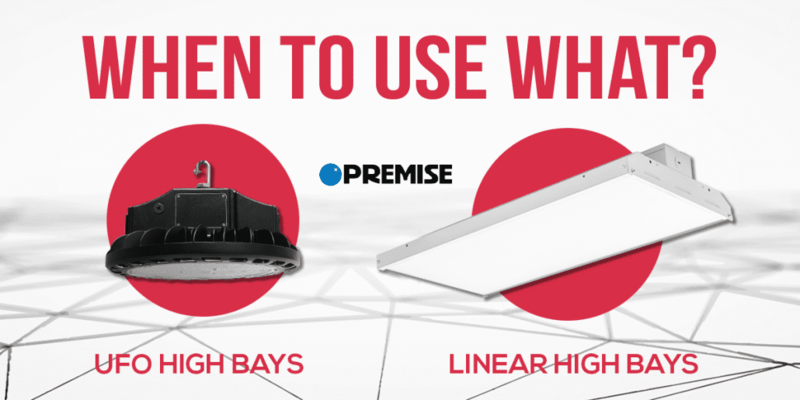 Need help with a lighting design to decide on the right High Bay to use? Contact our knowledgeable Lighting Layout Specialists for help! NEMA Type vs. IP Rating: How Are They Different? Connected Lighting Systems – Now, Soon or Much Later? Connected Lighting Systems – Now, Soon or Much Later? Comments Off on Connected Lighting Systems – Now, Soon or Much Later? Monopoint (Round/UFO) High Bays or Linear High Bays: When to Use What? Comments Off on Monopoint (Round/UFO) High Bays or Linear High Bays: When to Use What? NEMA Type vs. IP Rating: How Are They Different? Comments Off on NEMA Type vs. IP Rating: How Are They Different? Is There a Perfect Color Temperature for Lighting Fixtures? Comments Off on Is There a Perfect Color Temperature for Lighting Fixtures?